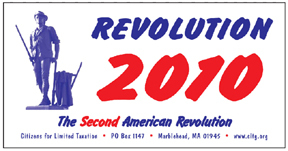 Calling all Minutemen - Revolution 2010 is upon us! Lost and Found Congressman Tierney's "Community Meeting"
The last gasps of an endangered species, incumbents? ● Repeal the Sales Tax-Hikers!